Over the past few years, ever since the advent of HIV and AIDS, there has been increasing discussion of the concept of sexual health. This upsurge is especially noticeable not only in the field of health education and promotion but also in academic sources. The recent discourse on sexual health is paralleled by an upsurge in the debate on sexual rights. This book examines the social construction of sexual health in India through an analysis of HIV and AIDS messages. The broad objective of the chapters is to trace the growth and evolution of the concept of sexual health from a health communication perspective and to understand the role of the state in determining its form and structure. The methodology used includes comparative analysis of HIV and AIDS policies, document analysis on HIV and AIDS, poster and short films analysis, in depth and open-ended Interviews and case studies. The book shows that Sexual Health is constructed in various modes in India. The models that are elaborated are the Medical model that constructs HIV scientifically and in terms of a compromised immune system; the Epidemic model that identifies risk behaviours and transmission routes and the Moralistic model. Social constructions of AIDS as plague or punishment against society are advanced by moralists who equate HIV with taboo social and sexual behaviour and the political constructions highlights public health in the face of obstacles to treatment and the delivery of services to people living with HIV. 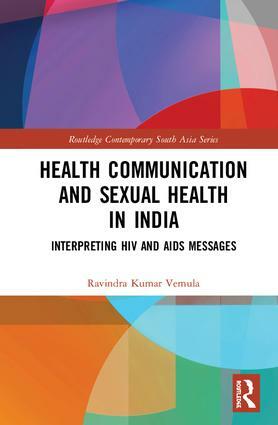 Bringing together current research and discussions on the three areas of policy, practices and theoretical perspectives related to the use and social construction of sexual health through HIV and AIDS communication approaches with specific reference to India, this book will be of interest to academics in the field of health communication, HIV and AIDS, and South Asian Studies. Ravindra Kumar Vemula is Associate Professor & Head, Department of Journalism and Mass Communication, The English and Foreign Languages University, Shillong, India and co-chair of the HIV & AIDS and Communication Working Group of the International Association for Media and Communication Research (IAMCR).